Winston-Salem, N.C., (September 16, 2014) - Switch on your proton packs because the boys are back in town! Krispy Kreme and Sony Pictures Consumer Products have joined together to mark the 30th Anniversary of the iconic blockbuster motion picture franchise with an exclusive offer of two new marshmallow Kreme(TM)-filled Ghostbuster treats inspired by the supernatural comedy's sweetest villains. 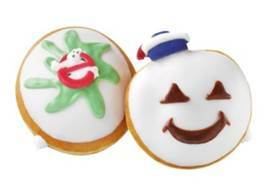 In conjunction with the release of the Ghostbusters/Ghostbusters II Limited Edition Gift Set Blu-ray release, Krispy Kreme is introducing Ghostbusters and Stay Puft Marshmallow Doughnuts that will be available September 29 through October 31, 2014 at participating Krispy Kreme(R) US and Canadian locations. While supplies last. Now through September 29th, contact your nearest participating Krispy Kreme location to pre-order five dozen or more Krispy Kreme Ghostbusters Doughnuts. "We are truly excited to collaborate with Sony Pictures in celebration of the 30th anniversary of the iconic Ghostbusters brand," explains Dwayne Chambers, Krispy Kreme, Chief Marketing and Innovations Officer. "And we are delighted to bring our fans two delicious limited edition treats that are as unique, creative and joyful as this beloved film franchise." "We are so excited about the 30th anniversary of Ghostbusters and our collaboration with Krispy Kreme Donuts as well as the launch of our new Ghostbusters website. Both brands have an incredible legacy with consumers and with exclusive donuts at Krispy Kreme locations and a retail promotion featuring the Blu-ray offering, we are confident everyone's proton packs will be loaded," added Greg Economos Senior Vice President, Sony Pictures Consumer Products. The Krispy Kreme Ghostbuster Doughnuts Available at participating US and Canadian locations only. While supplies last. Visit KrispyKreme.com for your nearest Krispy Kreme location. * Ghostbusters Doughnut: A marshmallow Kreme-filled shell topped with white icing, a decorative green "splat" inspired by Slimer, and a Ghostbusters logo sugar piece. * Stay Puft Marshmallow: A marshmallow Kreme-filled shell topped with white icing, decorated with Stay Puft Marshmallow Man's familiar face and a sugar piece hat. The Ghostbusters 30th Anniversary Edition on Blu-ray and the Ghostbusters II 25th Anniversary Blu-ray Edition, from Sony Pictures Home Entertainment is currently also available in a two-disc anniversary edition Blu-ray(TM) Digibook including both films, as well as a Limited Edition gift set that includes an exclusive collectible Slimer figurine and the two-disc Digibook. 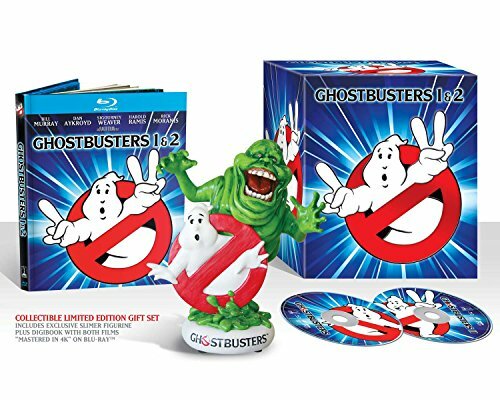 This special gift set will only be available for a very limited time, with the collectible Slimer figurine being a true must-have for fans. Both films have been fully restored and remastered in 4K and will be presented in high definition on Blu-ray from those 4K sources. Both the Ghostbusters/Ghostbusters II Limited Edition Gift Set Blu-rays come loaded with exclusive bonus materials, including revealing conversations with director Ivan Reitman and Dan Aykroyd, as well as never-before-seen deleted scenes from Ghostbusters II and more. The Ghostbusters anniversary edition features the original music video of the Oscar(R) nominated song "Ghostbusters" by Ray Parker Jr., while Ghostbusters II includes the original music video for "On Our Own" by Bobby Brown. In addition, Ghostbusters will contain all previously released legacy content, commentary and an interactive Slimer Mode, offering fans a picture-in-picture graphical viewing experience. Connect with Krispy Kreme and Ghostbusters at KrispyKreme.com, www.Ghostbusters.com, HotLightApp.com, Facebook, foursquare and Twitter, and KrispyKremeDoughnuts on YouTube. Krispy Kreme is an international retailer of premium-quality sweet treats, including its signature Original Glazed(R) doughnut. Headquartered in Winston-Salem, N.C., the Company has offered the highest-quality doughnuts and great-tasting coffee since it was founded in 1937. Krispy Kreme is proud of its Fundraising program, which for decades has helped non-profit organizations raise millions of dollars in needed funds. Today, Krispy Kreme can be found in over 850 locations in more than 20 countries around the world. (NYSE: KKD) is listed on the New York Stock Exchange. Visit us at www.KrispyKreme.com.